Celebrate the season on the high seas with winter wonderland décor, holiday parties and festive activities for the whole family on this special Thanksgiving voyage that is also one of Disney Cruise Line's special "Very Merrytime Cruises". You’ll also call upon Castaway Cay, Disney’s private island paradise — decked out just for the holidays — and sun yourself on white-sand beaches in tropical ports of call. Prices quoted are per person, based on double-occupancy, and do not include government taxes and fees ($104.69 per person), vacation insurance, gratuities ($84 per person), onboard expenses, shore excursions, airfare (where necessary) or other optional charges. Third, fourth, and fifth passengers may be added to select cabins at a discounted rate, making this a perfect vacation for families. Third, fourth, and fifth passenger rates vary and are based on availability. Stateroom capacities vary and not all staterooms are capable of holding four guests. A single supplement of up to 100% of the fare applies to solo cabins. Please call for details. Rates listed above are valid only on bookings made through Premier Custom Travel. 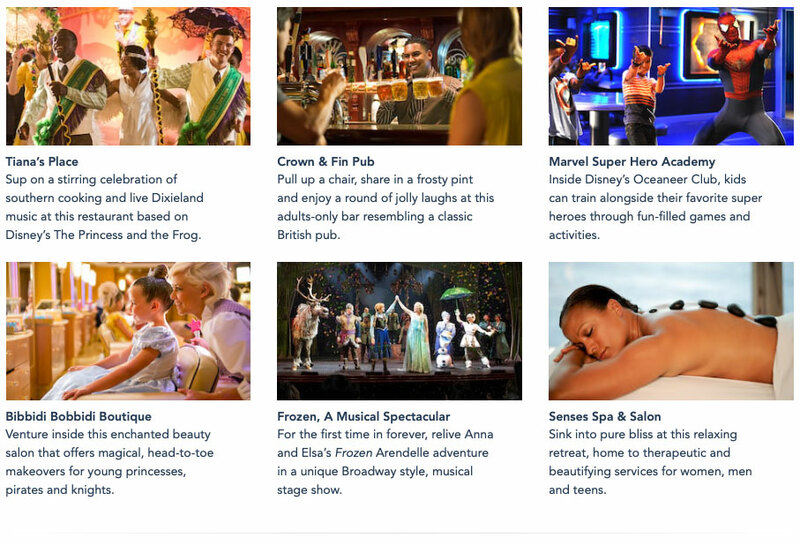 Bookings made directly with Disney Cruise Line or through other agencies will not qualify for group benefits or amenities and we will be unable to access or assist you with any outside reservations. Prices quoted are the most inexpensive cabin available in each class at this time. Other cabin categories may be available and we will be happy to give you a quote based on your preferences. All prices are based on availability and every attempt is made to keep these prices up to date. Rates may have certain restrictions. Photos of staterooms are for illustration purposes only. Airfare, airport transfers, insurance and pre-paid gratuties may be added to your reservation as needed. Pre-paid gratuties are $84 per person and cover the tips for your stateroom steward/stewardess and your dining room staff. Pricing for the other optional services varies and will be quoted when booking your cruise. Payments may be made in any amount and at any time as long as the full balance due is paid on or before July 25, 2019. A quote for the optional insurance will be given when we price your cruise. 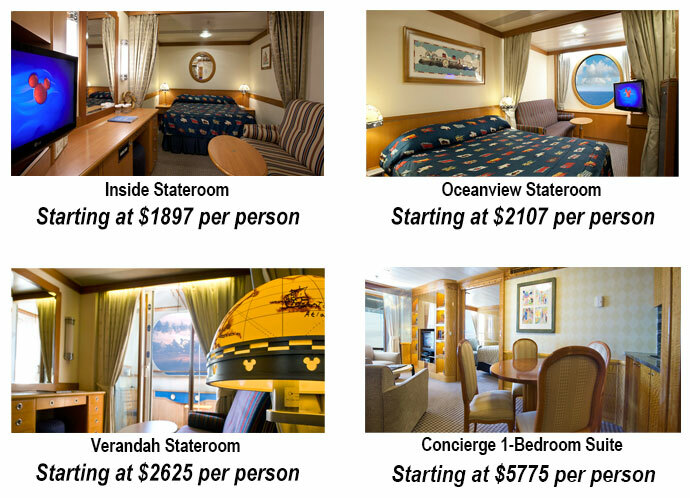 Prices vary by stateroom type. Insurance premium is non-refundable once purchased, must be paid in full at time of purchase and may only be purchased prior to making your final payment. Should you need to cancel, here are the cancellation penalities. Please note that these are the basic guidelines and reservations made under restricted or promotional rates may have additional conditions which will be listed on your specific reservation confirmation. Nassau, the capital of the Commonwealth of the Bahamas, is the largest city on New Providence Island. Nassau has long stood as a harbor of immense appeal to tourists seeking its agreeable climate, natural beauty, world-class leisure and scintillating nightlife. Its proximity to the United States—just 180 miles off the coast of Miami, Florida—has also helped secure its status as a popular vacation resort. Experience all the pleasures that have made this Bahamian getaway so beloved and well-frequented. Nassau boasts outstanding shops and breathtaking beaches where you can spend a glorious afternoon sunbathing, swimming and relaxing on the soft sands. There are also a huge number of shallow wrecks for adventuresome divers to explore. In Nassau's famed Old Town, you’ll find the city's Parliament Building. This structure is painted a unique shade of pink and helmed by a statue of Queen Victoria—a remnant and reminder of the island's British colonial past. A tour around the island—paid or self-guided—will reveal interesting old forts to explore, including the historic Fort Fincastle. Discover the 2017 Cruisers’ Choice top-rated cruise line private island destination. 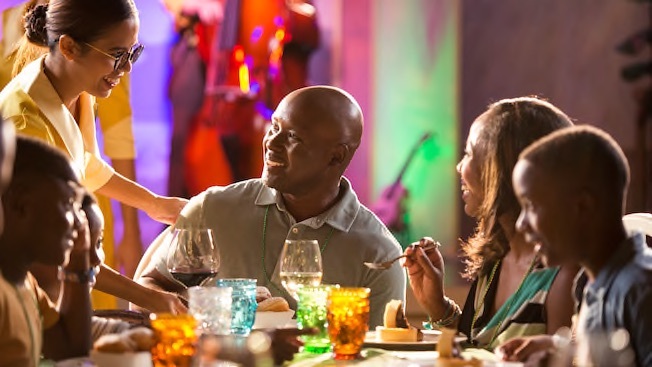 Castaway Cay invites cruisers to enjoy balmy tropical weather and world-class recreation on a Bahamian oasis with signature Disney hospitality. After disembarking on Castaway Cay, you can obtain beach towels and use your convenient Key to the World cards for retail transactions on the island. Everything needed for the perfect beach getaway is here — from lounge chairs and beach umbrellas to tasty food and family-friendly entertainment. Castaway Cay visitors find an island completely outfitted for premium family leisure. Ample amenities include sprawling beaches, sparkling lagoons teeming with curious sea life, splash-worthy water play areas, scenic walking trails, open-air BBQ dining locations serving complimentary meals, 2 shops featuring Castaway Cay gifts and souvenirs, free tram transportation around the island and more. Take advantage of Disney Character Greetings, including a Dance Party with Lilo and Stitch. When you’re ready for some solo time, supervision for children ages 3 through 12 by Disney counselors is available at Scuttle's Cove, an on-island kid’s club. As the largest island in Florida, Key West measures 4 miles long and 2 miles wide. The island represents the southernmost point in the continental U.S., and because of proximity to the Gulf Stream, enjoys a mild tropical climate. Historical significance meets heavenly bliss in this place that offers old architecture and modern comforts. Stand at the southernmost point of the continental United States! Be sure to bring your camera to take pictures with the signs marking the significant point. From here, you're only 90 miles from Cuba. Ernest Hemingway penned his masterpieces, Farewell to Arms and For Whom the Bell Tolls, while living in Key West. Step back in time and visit his former home to explore the rooms and gardens where the Nobel Prize winner lived and wrote for over 10 years. A full list of shore excursions and pricing will be available once your vacation is deposited. Excursions listed above are samples for illustration purposes only. Pricing and availability may vary by cruise. Leave the cooking, cleaning and decorating to us—and enjoy more quality time together with loved ones as you sail from one spectacular port to the next. 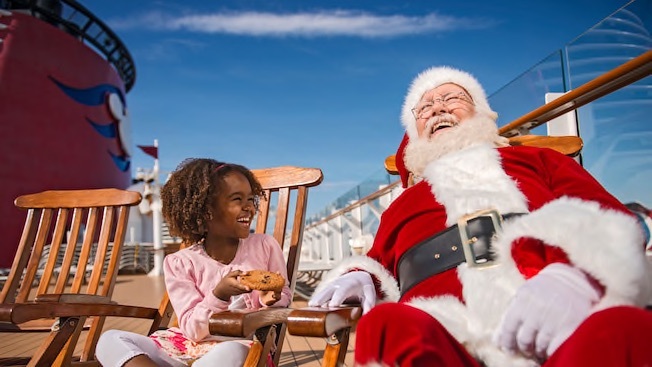 Plus, during your cruise, you'll also enjoy a gift that’s both nautical and nice: all the holiday magic offered on our Very Merrytime Cruises. Delight in seasonal magic at sea and discover a jolly fusion of holiday-themed entertainment, activities and décor. Candy-cane limbo, dancing and games—share in the yuletide magic of the season during this jovial celebration. Kick off the season during this festive gala where kids can help light the ship’s Christmas Tree. Share hugs and snap photos with the one-and-only Kris Kringle before he takes to the sky to deliver gifts to the children of the world. Meet some beloved Disney Characters in jolly holiday attire and take one-of-a-kind pictures to cherish throughout the year. Teens and tweens can party it up with new friends during music and dance extravaganzas that fill the air with joy. Gather the children in the atrium to hear Mrs. Claus read well-known Christmas stories from her rocking chair by the tree. Decorate stockings, create festive cards, embark on a holiday scavenger hunt and more—it’s Christmas cheer for the young and young-at-heart. Made completely from edible ingredients, the ship’s gingerbread house is a life-sized treat that you can photograph, but can’t eat! ‘Tis the season to pick up exclusive, holiday-themed Disney Cruise Line gifts for family and friends—and make Christmas wishes come true. A winter wonderland awaits you aboard ship — as well as on Castaway Cay! Disney's private island paradise is transformed with "snow" flurries, a Christmas tree and more. Be on the lookout for Mr. and Mrs. Snowman, dressed in their island attire. Plus, the island's tram is decorated to resemble a reindeer, complete with antlers and a tail. Attention out of town travelers: All of your travel arrangements may also be made through Premier Custom Travel, including airfare, local hotel accommodations and even transfers to/from the airport and cruise terminal. Simply ask about these additional features when booking your cruise cabin. This cruise will depart from Galveston Cruise Terminal #2. For those driving to the ship, we recommend pre-paying your parking in Galveston to receive a discounted weekly rate. Prefer to arrive via towncar or limo? Premier Custom Travel can help with those arrangements as well. Since our cruise will be visiting international destinations, we STRONGLY SUGGEST that you carry a passport. If you need information on obtaining a passport, please visit this page. Plan on traveling without a passport? If so, you'll need a government-issued photo ID (such as a driver's license) and an original copy of your birth certificate. You will be denied boarding without a refund if you do not have proper identification at the time of boarding. Your cruise must be booked by phone, while payments may be made by phone or by clicking the link below. Have special needs? We can help.